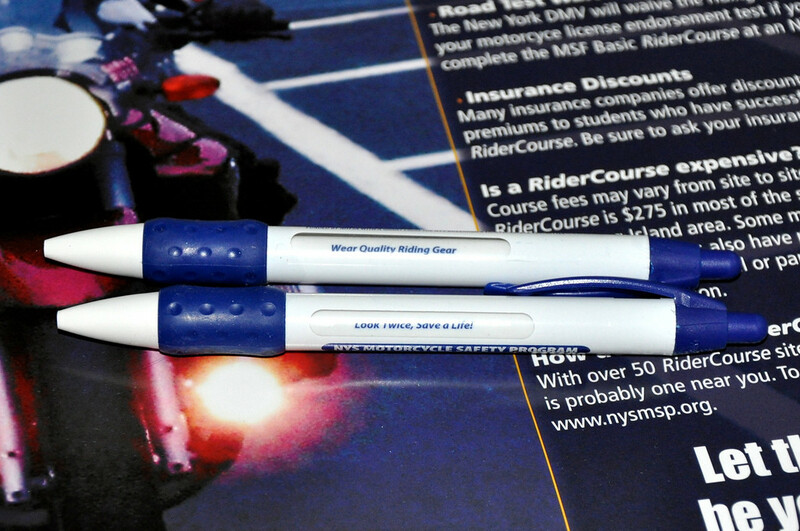 A few weeks ago after picking up a ‘Watch for Motorcycles‘ bumper sticker in a local bike shop, I faxed a letter to the New York State Governor’s Traffic Safety Committee. 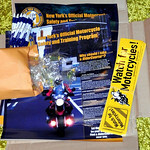 In my fax I stated that I was a New York State motorcyclist and requested that if possible, that I’d like to be sent a few more bumper stickers to distribute to my friends and family. I got no response to my fax though I included my email address along with my name and street address. That was until yesterday… after work I received a large square box from the Traffic Safety Committee. 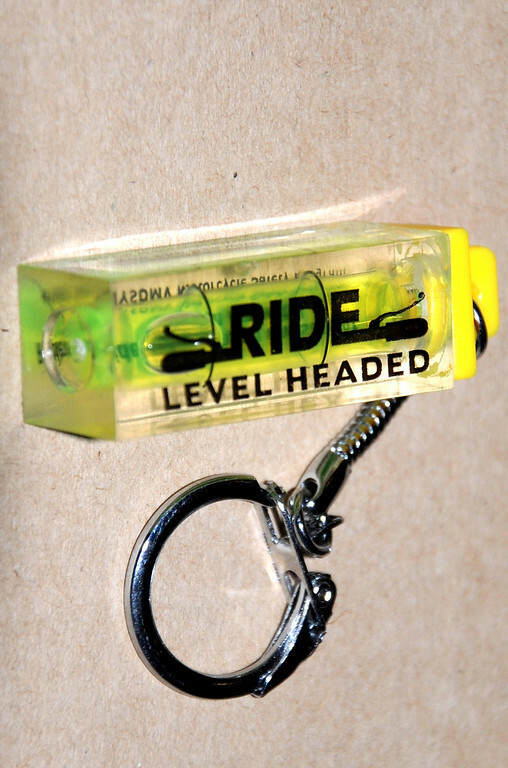 Inside the box was a stack of about 40 bumper stickers, a roll of pens, 2 posters and a manila envelope full of keychains to distribute. Way to go New York State! 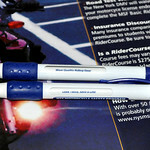 The pens have rotating sayings when you click the top button: “Wear Quality Riding Gear”, “Look Twice, Save a Life”, “Enroll in Rider Training”, “Wear Reflective Gear”, “Don’t Drink & Ride!” and “Learning is for Life”. 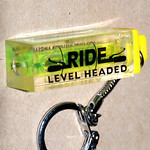 The keychains are a small liquid level that reads “Ride Level Headed”. 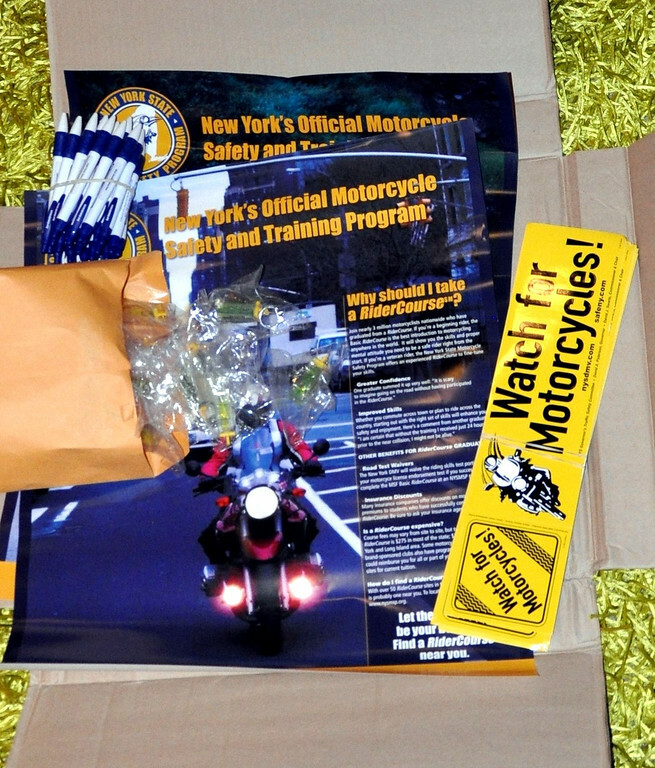 The posters contain information on why and where to take a RiderCourse to learn to ride and last but not least the bumper stickers are 2-part Watch for Motorcycles decals. I’m so surprised and really pleased! Score!!! Sometimes NY does pull through for riders that is great! Nah Sothy, you are paying for those fancy orange plates that are all the rave.